Hi everyone! I've been spending a few days this month going through my sewing space and organizing everything - getting it ready for new projects and a new year of creating. I'm not always great about cleaning up the last mess before I make a new one so it's really nice to have a clean fresh start this year. Now that everything is put back in it's place, I thought I'd share with you some of my favorite tips and tricks for keeping a sewing space organized. This will be a month-long blog series, and every Wednesday I'll share more tips! 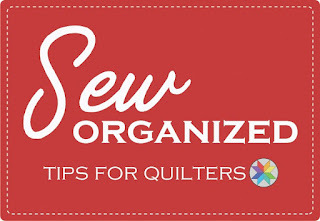 This week we'll focus on sewing tools and quilting rulers. 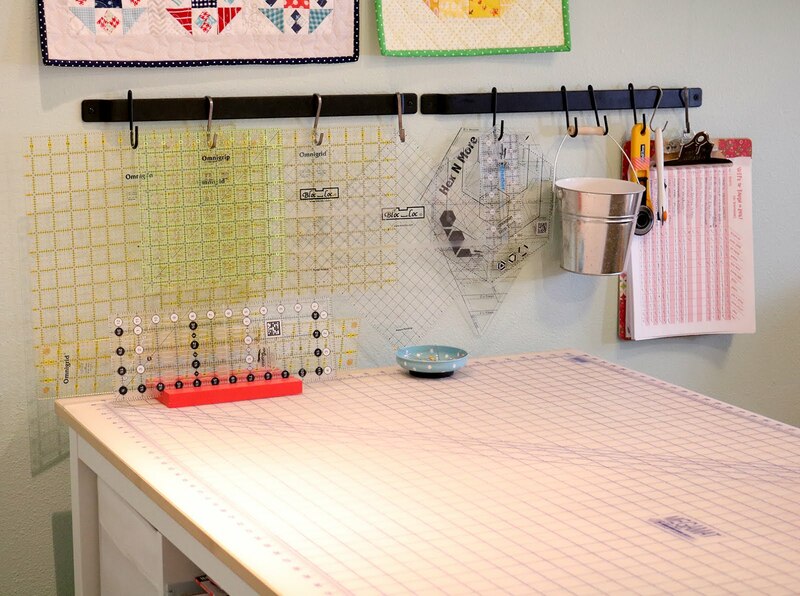 Now, it's no secret that quilters have a LOT of tools. The problem I find is that some tools are used rarely and can be put away until needed, but there are quite a few tools that I use frequently and I like to have them handy. So what to do with them? IKEA to the rescue. This organizer set was designed to be used in the kitchen, but it does a great job with my favorite tools! I have it mounted on the wall next to my machine. One bin is all scissors and hole punches. The middle one is for pens, pencils, fabric markers, and sharpies. The flat tray is perfect for holding my most-used presser feet, seam gauge and the screw driver that is required to change the presser feet on my machine. And full disclosure here, I usually have a lip balm, hair tie, and some type of chocolate on that tray as well. You know...all the essentials. The organizer is called Grundtal and you can find it here from IKEA. 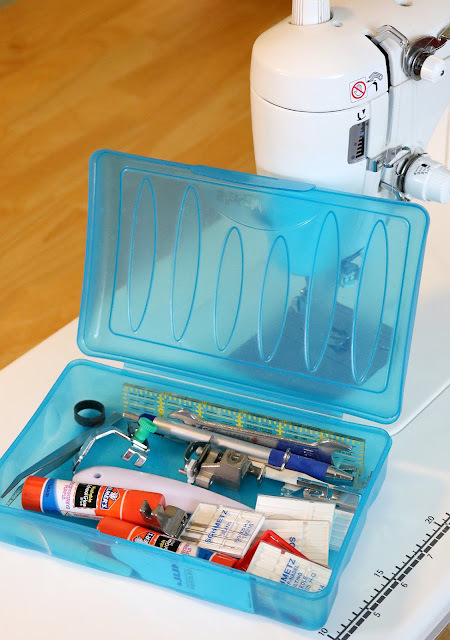 Another tool organizer I love is this little blue bin. I keep it sitting next to my machine and it holds the other tools that I use a lot. When I am sewing away from home this is the bin that travels with me. It has extra needles, all of the other presser feet, tweezers and a paint brush for cleaning my machine, and some glue sticks for when I'm paper piecing. Next up are all of those quilting rulers in every shape and size! They're so handy to have, but once you buy them you also have to store them, right? 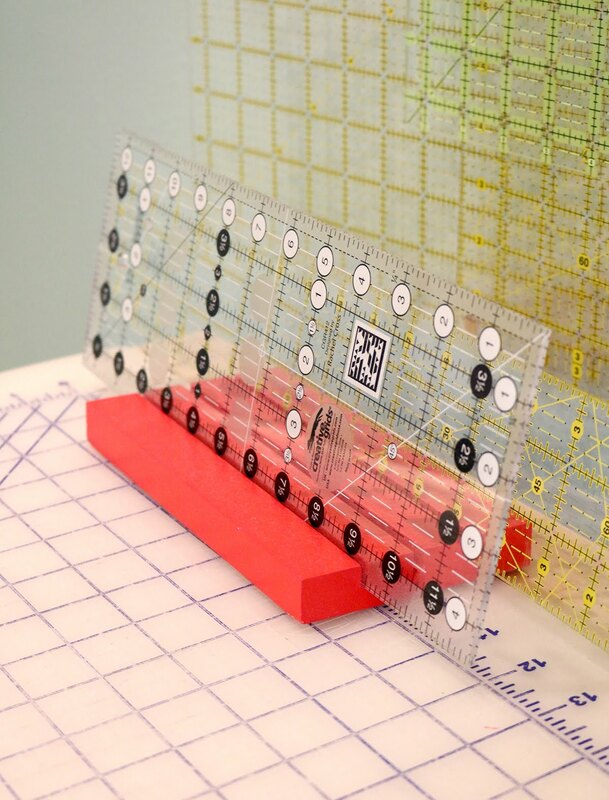 My two favorite and most-used rulers stay on my cutting table in one of these handy Ruler Pals. The Ruler Pal can hold up to three rulers and they come in all of these fun colors! Having them on the table like this makes them quick to grab and easy to put away. The majority of my other rulers I hang on a bar at the end of my cutting table. They're out of the way, and I can see just what I'm looking for. These black metal hanging bars are no longer sold from IKEA but the Grundtal hooks (the silver hooks in the photo below) work perfectly with the rulers so I would recommend using the Grundtal bar with the hooks for your quilting rulers. And these two magazine holders sit on a shelf below the cutting table. Still easy to get to, and I know right where to find them - and the rulers are protected so they won't get bent or broken. 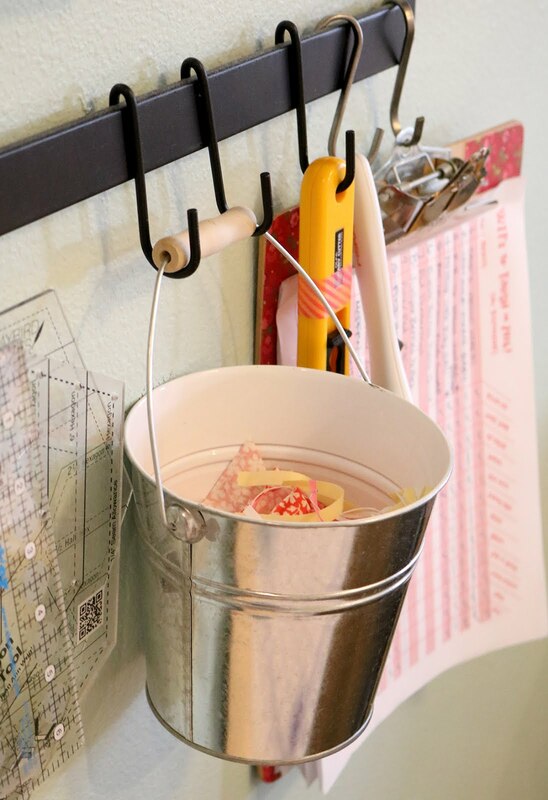 You can find magazine holders at most office supply stores as well as Target, IKEA, & The Container Store. I found that for larger trimmings and trash it was fine to dump them right into the big waste basket at the end of the table. But for smaller bits and trimmings I loved having this little bucket handy to just toss them into. When the bucket is full, I dump it into the waste basket - but usually it takes me a month or more to fill it. I actually learned this trick from Jodi Nelson (Pleasant Home) and at first I thought it was silly - until I tried it! And now I love it and use it every day. So there you go! My favorite tips for keeping all those quilting tools and rulers organized. 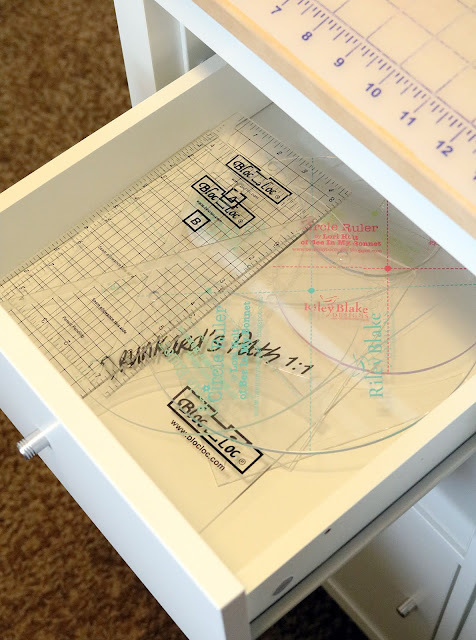 Do you have a great way to store your favorite tools and rulers? I'd love to hear your ideas! 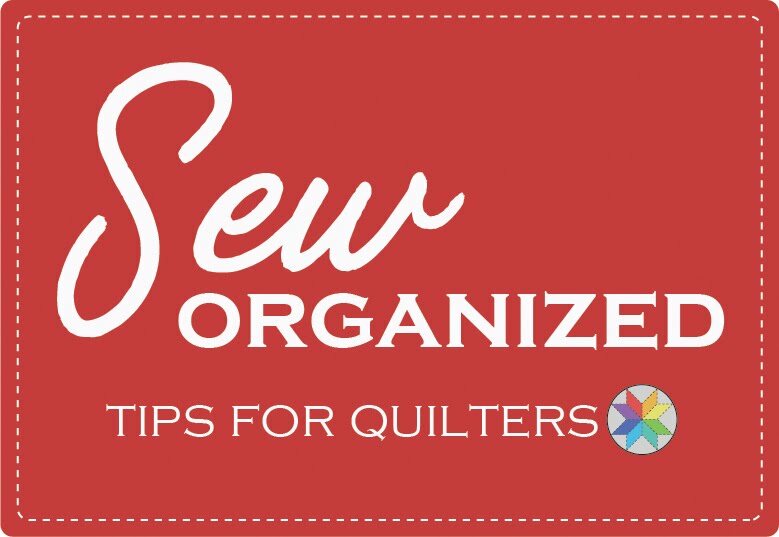 Next Wednesday I'll share part 2 of my Sew Organized: Tips for Quilters series: patterns, papers, magazines, & books....all of the papers that we quilters love to hang on to. Want to come back and read more later? Pin one of these handy images so you can find these articles later! 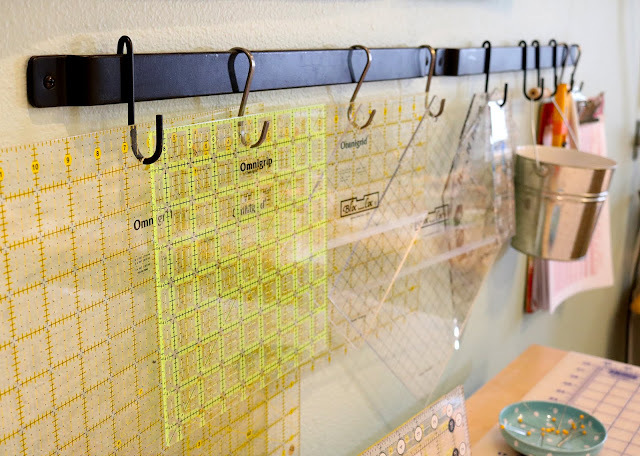 And if you want to see more organizing ideas, check out my Sewing Room Organization board. I use a pampered chef tool caddy. It rotates and holds scissors, pens, rotary cutters, markers,clippers, tweezers, seam rippers and so many other things all within easy reach and off the table/counter. Now that's a great idea! I love that it rotates and from the photos online it looks like it could hold quite a bit! I love your tips! The bar is such a great idea and it just so happens my daughter is going to Ikea very soon! 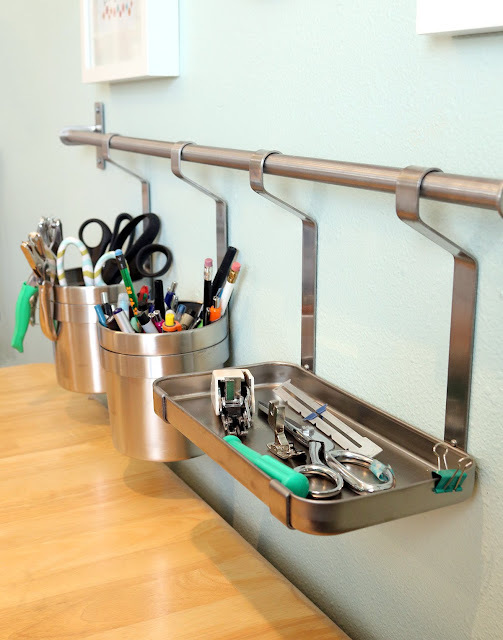 There is nothing better than having all your tools handy...great tips! So many great ideas here! I need to sort through my things to get them organized, then use your tips! Thank you! Where do you get the cutting table "cupboard" combo. IT is exactly what I need. Looking forward to your post on this amazing table. I also would like to know where you got your cutting table. Love it. 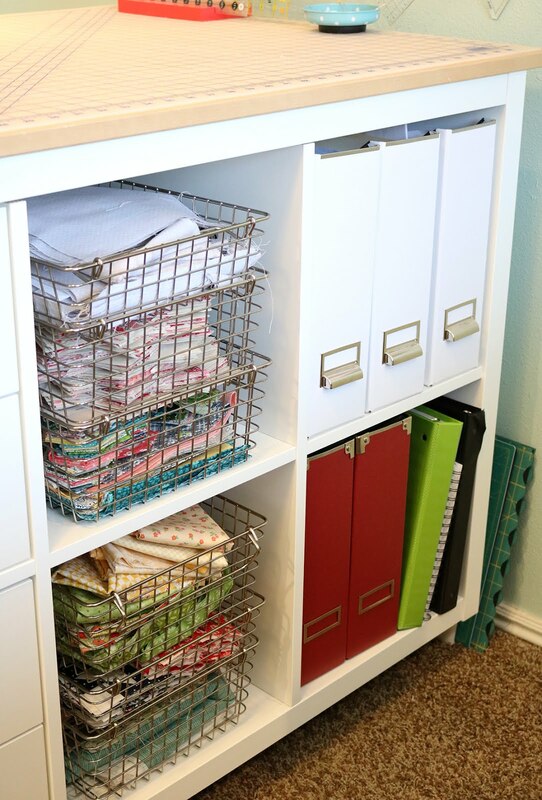 Love all your organizing ideas! Thank you for the Ikea link and I'm looking forward to your next post. I use a pretty wooden silverware caddy (from Function Junction) with 4 cubbies for my scissors, cutters, pens, seam rippers. 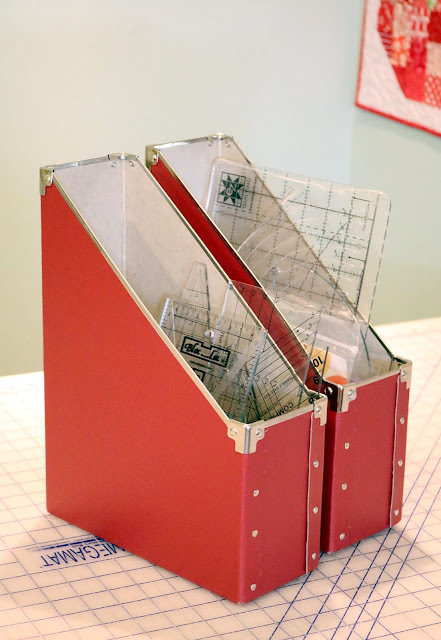 It has a larger cubby (the size of the 4) where I put my small reference books that I use often. 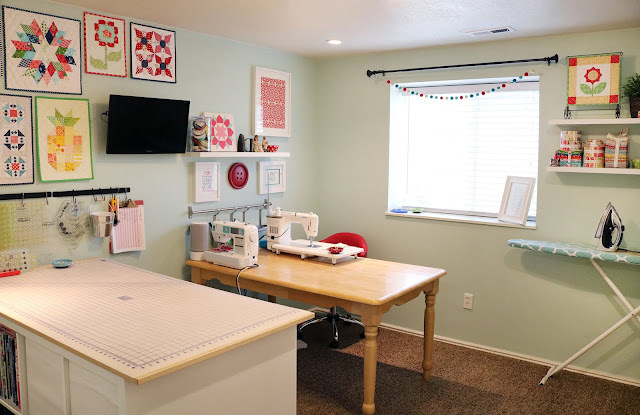 It's easy to move from beside my sewing table to my cutting table, etc. Clever AND portable - love it! And I've never heard of Function Junction but I just checked out their website and it looks like a store I could spend hours (and $$) in! This is great. I need me some of these hanging things. Hi Kelly, I greatly appreciated your tips and hints for organising our quilting equipment. I'd been storing my rulers on a desk top gadget but it was flimsy. Then I saw your folder holder idea and it is perfect for me. As I'm not permitted to punch any holes in my walls as I rent. Thanks for sharing you wonderful knowledge, Julie in Adelaide Australia. I love the little pail.....what I did was take a small coffee can, gave my granddaughters glue sticks and fabric scraps, let them.glue the scraps all over the can, then I sprayed clear polyurethane over it and now have a cute can that reminds me of them plus, like you say, easier to throw those small scraps in. My husband bought and hung a steel peg board next to my sewing machine. I can hang all my grids, scissors, rotary cutters, etc within a fingertips reach. It's industrial looking and keeps me very organized. Use those tiny strips of scraps for the birds. I have a 'nest keeper' hanging outside my window. It is a metal spiral sphere that I insert pine needles and fabric scraps. I watch the birds take the scraps and I can also spot them in the nest if they are not too high in the trees.